Drop-in appointments are available on a first come, first served basis and are offered when a previously scheduled client misses their appointment. If you’re trying to claim a missed appointment, please note that appointments are considered missed after 10 minutes, so you will only receive the remaining time of that appointment slot. Drop-ins are welcome; however, reserving an appointment time through the online system is strongly recommended as we cannot guarantee the availability of a drop-in time. 1. Click on the clock icon to the left of the day you would like to be placed on the waitlist. 2. 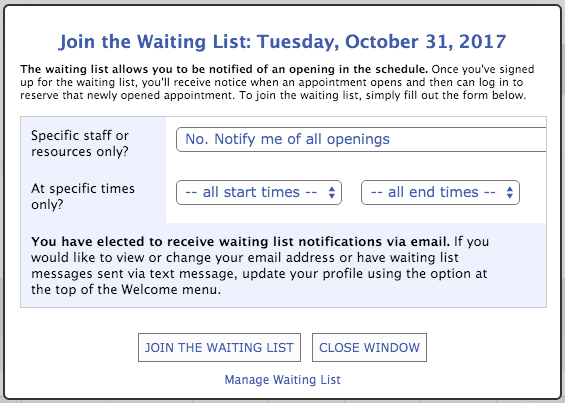 Please select a start and end time for when you would like to be notified of open appointments. Then, press "Join the Waiting List." The greater your availability, the greater your chances are of being able to claim a canceled appointment.